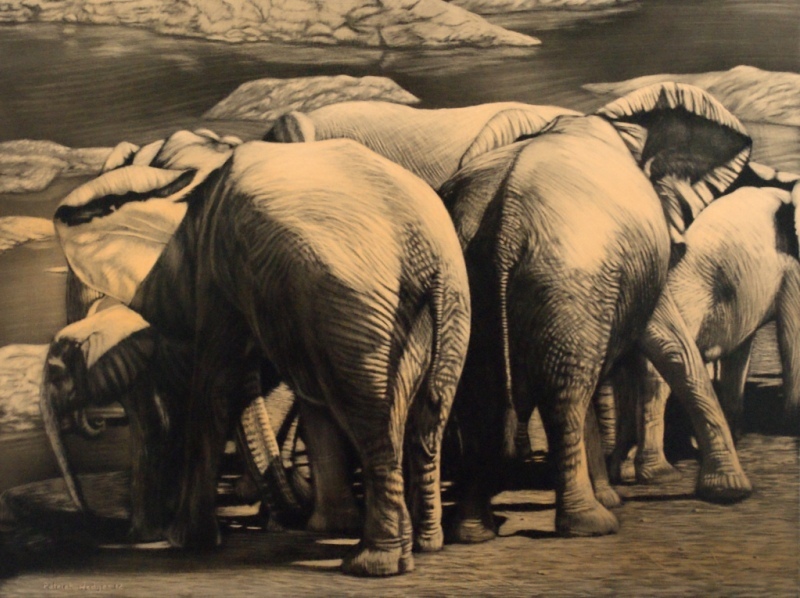 Here are a couple of scratchboards from my time in Etosha National Park in Namibia. The first is a group of Elephants around the waterhole at Halali. It’s called “Total Protection” because of way the young are protected by the adults. It’s created by fibreglass brush removing the ink in a soft focus fashion, then adding ink back in (diluted in an airbrush), re-scratching, re-inking, re-scratching, re-inking etc as many times as it takes to get the effect I need. Finally I’ve sprayed the whole thing sepia to keep the monochrome effect but also add that little bit of old time feel to it and the sunshine and dust of Africa. 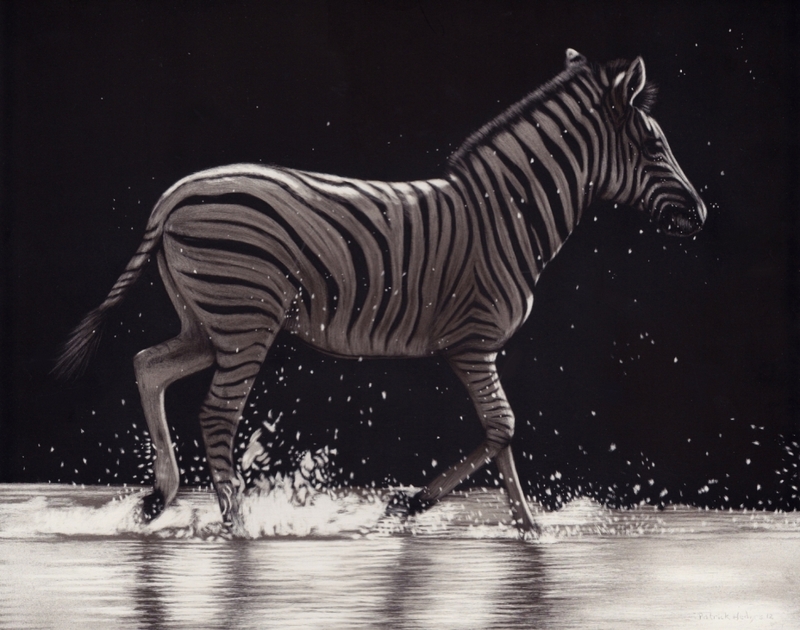 The second piece is a young zebra trotting through the water after its mum in a piece called “Water Baby”. It’s from a zebra at the waterhole at Okaukuejo. So why is Etosha a strange place? Well, it’s an extremely dry place. 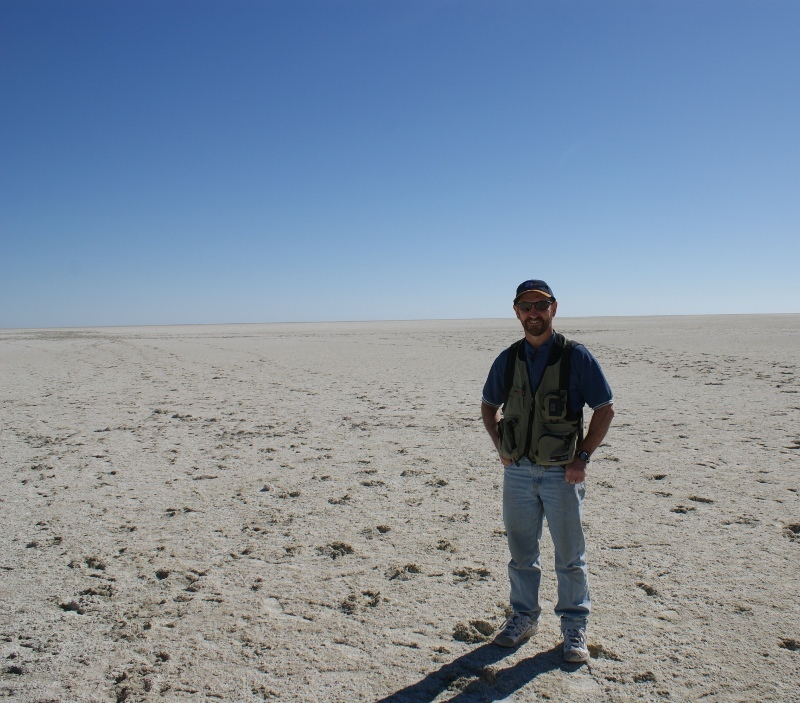 It has a vast salt pan which is eerie and beautiful. The park has very little precipitation and as such it doesn’t support a lot of the animals you’d expect. It has no hippo, no buffalo and no crocodiles. 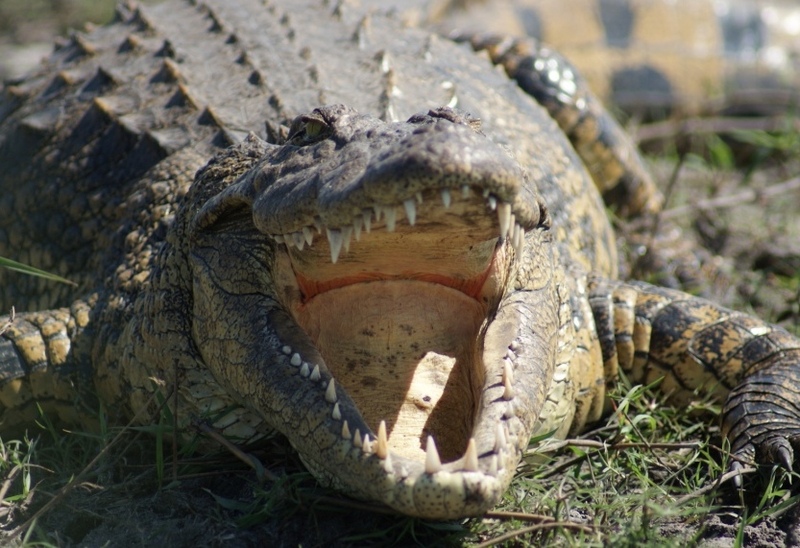 Nip across the border into Botswana and in the Okavango Delta or Chobe National Park you’ll encounter as many hippos, buffalo or crocodiles as you might wish to see. Here’s a croc I photographed at Chobe. Believe it or not, this is in the wild and I’m not using a zoom. I’m literally a metre away from this large croc. However, I’m in a boat and it isn’t. It’s also just been fast alseep and is simply releasing heat through it’s open jaws so I’m neither being brave nor foolhardy. So what’s going on in Etosha? You’d expect, with all that water in my pieces of art, to see all of the missing animals. No, these are man made waterholes, specifically created from boreholes to draw the animals to them in large numbers so we can get a good look at them. It works too. There were so many elephants at Halali, scores of zebra coming to drink all day at Okaukuejo, and at another waterhole, Namutoni, the best you can come to seeing a large predator is the python that swims there yet the air is thick with birdlife. Is Etosha worth the trip? You bet it is! Not only do you get to see an abundance of wildlife at these waterholes, but if you venture out into the arid areas, you’ll see plenty from little dikdiks to the gorgeous lilac breasted roller, male oryx sparring for dominance, lion and many other animals. If your main love is monkeys however, you’ll be disappointed. There are none at all. In fact the campground pests aren’t monkeys here but go-away birds, red-billed hornbills and jackals – what a fabulous camping experience when those are considered pests!! 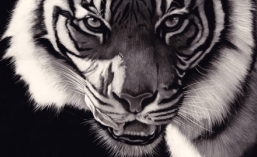 This entry was posted in Scratchboard Blogs, Travel blogs. Bookmark the permalink. Thank you for your explanation of how you achieved your work, I will be experimenting in the future. The description of the area and the wildlife present is amazing. I am just starting to follow related blogs and fellow artists, allowing the understanding of other methods of creating reality in my works. My method has always been to use a series of hypodermic needles and pastels to replicate my subjects. I have been scratching for 42 years and just recently been showing my works. Thank you for your communication when sharing your experiences and expertise. I too was a Bushwackers kid (’67). Just found photos, and film that mom shot. Am getting all xfered to DVD.